Blockchain Technology has revolutionized our world - and now, it gained another revolutionary feature. FairCoin has just launched world's first cooperative Blockchain - introducing the Proof of Cooperation (PoC) consensus! Traditional cryptocurrency mining takes an enormous amount of energy - which makes it not only expensive, but also takes a toll on the environment. Faircoin operates on a completely different system - it calls itself the "cooperative version of Bitcoin". There is barely any energy needed to confirm transactions, and the use and distribution of FairCoin are based on social justice and equality criteria. Usually, for example within the Bitcoin network, so-called miners validate the transactions by solving complex mathematical problems. Whoever solves the problem and validates the block receives the Bitcoin reward. This is why big cooperations have built huge Bitcoin mining farms, consuming hundreds of megawatts of electricity. Proof-of-Cooperation does not have this mining functionality. Instead, there are certified validation nodes (CVNs) which cooperate to secure the network. How does the proof-of-cooperation algorithm work? The consensus rules determine which CVN has to create the next block. Each CVN approves that CVN by digitally signing a piece of data which contains its unique ID. After the respective CVN received all the necessary signatures, it takes pending transactions and forms a new block which is then stored in the immutable and distributed blockchain database. There are no rewards for block creation. Only a very small fee is awarded for any block creators to compensate for the energy and bandwidth costs of running a CVN. So even if the network grows and there are countless more CVNs, the power consumption will still be low since a CVN can run on a Raspberry 3 that only consumes a few watts. Nothing compared to a large Bitcoin Miner. "Two years ago I became aware of the enormous demand for energy and the concentration of power around some pool operators in the Bitcoin network. I thought that there must be a better way to do it. Why not try to let nodes co-operate instead of competing to generate blocks?" 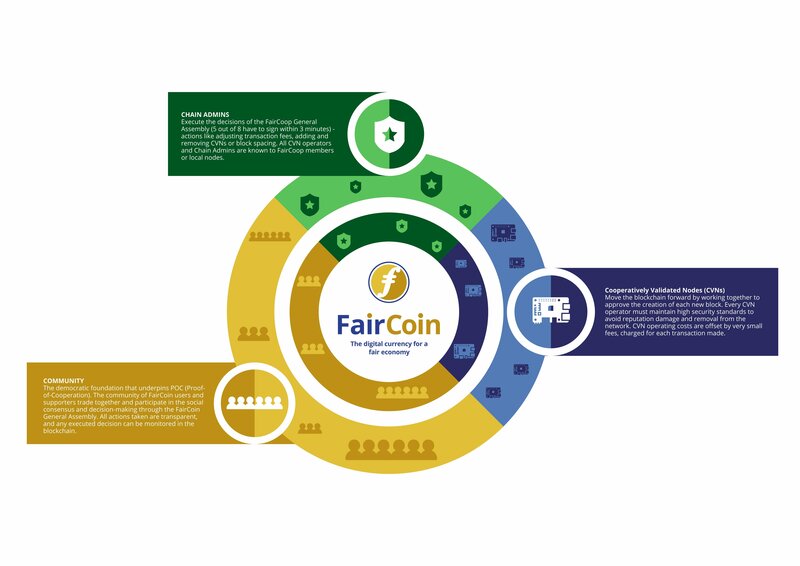 FairCoin is a part of a cooperative Ecosystem that aims to create a fair economy. Part of this ecosystem are payment systems (FairPay), savings and donation tools (FairSaving, FairFunds), a system to sell and shop online (FairMarket), and even an opportunity for self-employed business owners (FreedomCoop). 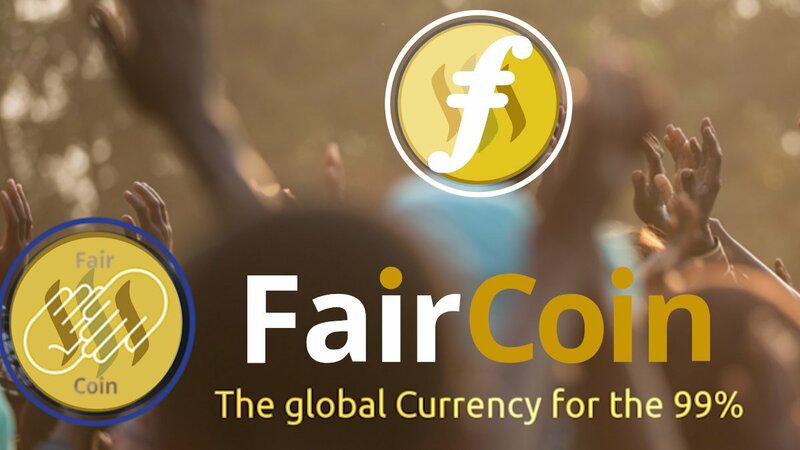 FairCoin is not only a cryptocurrency, it's one element within a system that enables users to send transactions between continents, countries, users, or even between ordinary bank accounts. FairCoin tokens can be sent to other FairCoin wallets, exchanged to other currencies instantly or withdrawn in Euros/Dollars at an ATM. There are also point of sale systems for merchant users and prepaid cards. Due to the minimal / zero transactions fees, FairCoin is one of the best cryptocurrencies to be used for micropayments. FairCoin introduces a new kind of Blockchain - world's first cooperative Blockchain. The technology has been in the works and was successfully implemented on July 18. The revolutionary new Proof-of-Cooperation consensus doesn't have a mining mechanism, but instead works with CVNs who secure the network cooperatively. This way, the energy consumption is extremely low! 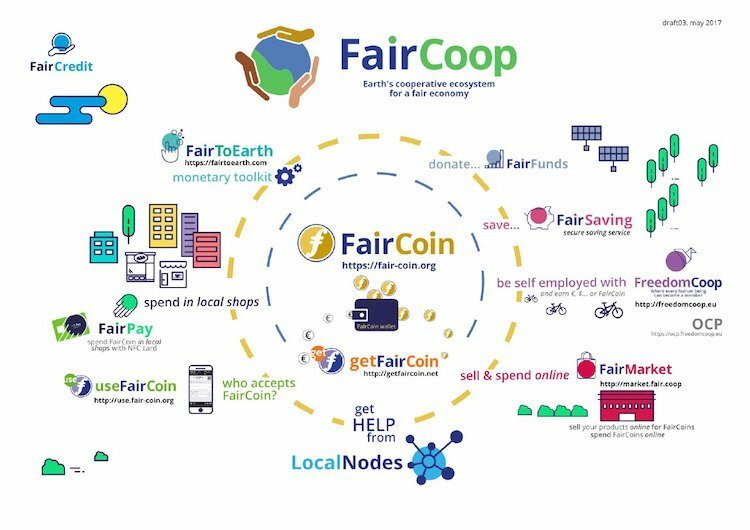 FairCoin is part of a whole ecosystem by FairCoop, which aims to create a fair economy for both the users and the environment. In my personal opinion, this project has a lot of potential and I appreciate the revolutionary idea and the totally different approach. It takes a lot to create an entirely new technology like this one - and the implementation was successful! I'm excited to see how FairCoin and the Proof-of-cooperation consensus will develop in the future. What do you think about FairCoin and its new type of cooperative Blockchain ?